A number of years ago, before Reggie dared test the waters of bloggerdom with his silly scribbles, there was a luminary in the blogosphere that he followed as a regular reader and sometime commenter. To call her a "blogger" is a meagre understatement, for she is far more than that—she is a whirling dervish of creativity, style, and elegance, and a person of the most exquisite and sublime taste imaginable. She is a sparkling beacon in the design world, a jet-setter of the most rarified sort, and an author of more than twenty iconic design books. Her name is Diane Dorrans Saeks. She can be found at her marvelously absorbing blog The Style Saloniste, as a contributor in the pages of shelter and lifestyle magazines, and on the bookshelves of virtually anyone who follows and is interested in the world of design. Back when I was still but but a commenter on others' blogs, Ms. Saeks urged me to start up my own blog, and she encouraged my rather mundane efforts at it, confident that I could do better and one day be something of worth (or at least amusement) to the 'sphere. 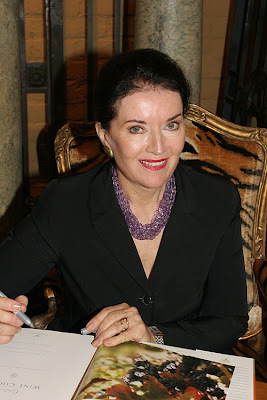 I count Ms. Saeks—along with Mrs. Blandings, Emily Evans Eerdmans, and the Blushing Hostess—among my earliest champions and as someone to whom I will always be indebted for giving me the courage to strike out on my own and follow in the shadows of her vaunted and very well-shod blogging footsteps. 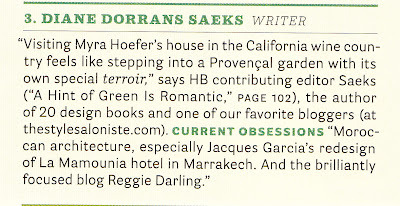 Imagine my surprise and rapturous pleasure to find Ms. Saeks' quote in the current (March) issue of House Beautiful in which she notes the blog you are now reading, Dear Reader, as one of her "current obsessions." Reggie is all agog and astonished as such an accolade, and he returns it with lavish praise and blushing thanks to Ms. Saeks, a beacon in the worlds of design, elegance, chic, and grace. Thank you, Diane Dorrans Saeks. I am truly honored and grateful for such approbation. You are, in a word, divine. You're divine even when unfocused:). Congratulations! This is, and we make no attempt to flatter, no more than you deserve. 'Reggie Darling' remains high on our list of essential 'blog' reading not only for its inherent wit and charm, but also for the insight which it provides into life in and around Darlington House as well as the wider world. Each post guarantees that some topic, domestic or wide ranging, is covered in an erudite manner which leaves the reader, as should be the case, wishing for just that bit more. Long may it continue. Reggie Darling you are also divine. I was just yesterday having a tea with one of my very good friends and we were discussing how much we love your blog! You must have been thrilled to see that in House Beautiful, congratulations. It is well deserved! Congratulations, Reggie. A well-deserved accolade! I saw that in the magazine and was so pleased for you. She is, as you say, so much more than just another blogger! I am blushing. I am astonished. Thank you a million times. I recall vividly your first message asking me to check your blog concept and your first post to see if it would work and were you 'ready' for publication. You have a strong and individual and kind and powerful voice, you have wit, you have oodles of charm (I know all this, and we've never met) and you are essential on the internet. You are also a wonderfully focused writer. Your words are vivid, heartfelt, insightful and full of inspiration and charm. For a brief tune-up, everyone should read your post about 'how to be a good person' which starts with the advice 'make your bed every day' and continues with 'get a hair cut'. That is all you need in life. Perhaps we could add 'Be kind to others' or 'have fun' and you probably did. I love your 'online publication' and read it religiously (with a Bible in one hand?...) and it is always fresh, sometimes brief (snowdrops) and nothing is every superfluous. I wish you many many wonderful years in this ether of the internet. this gave me a big smile this morning! Well, around here, among your long-time friends, DDS' words might seem like preaching to the choir, but it's great to have your excellent blog recommended to a brand new audience--and by such a respected voice, at that. Congratulations! To be referred to in the same breath as La Mamounia by DDS is indeed an accolade. Her post on Morocco and this fabled hotel was wonderful and most informative for any discerning would be traveler. I have never been but it is now at the top of my list as long as I can stay at LM. Congratulations, dearest one....you really deserve it. You are indeed a most delightful addiction. Congratulations! An accolade so richly deserved. Bravo, Reggie Darling! You are an inspiration, and this HB mention is just the beginning of the much-deserved praise, I bet. I wish I could embrace you right through this computer screen. Will a virtual hug or congratulatory handshake do? You do deserve every marvelous award. I can see why being quoted in House Beautiful made DDS think of your blog. She may have inspired you, but you're always an original. We all adore your blog! Bravo dahhling! you absolutely deserve the praise your blog is incredibly focused & interesting indeed! recognition. Please continue. From The Squirrels of Darlington to the Super Bowl--it's all good. Congratulations! 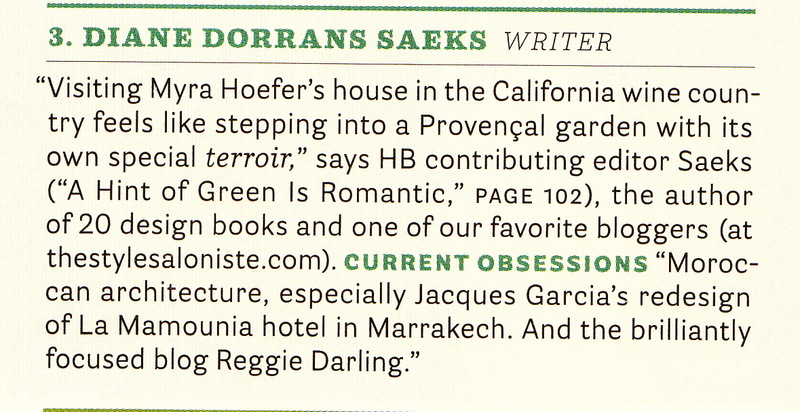 I, too, saw this mention of your wonderful blog in the issue of House Beautiful and was quite impressed! And such an honor coming from Diane- her blog is one of the best.